about this book: "Red Fox Woman" was a story that was always swirling around in my mind. The rough draft of the manuscript was gathering dust, hidden in a drawer, when I pulled it out for a rewrite. 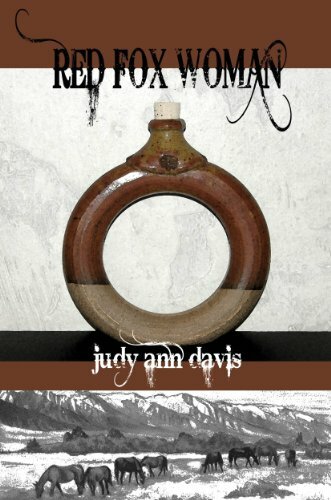 The central theme is about a redware potter, Julia Gast, who flees from Pennsylvania to the Colorado Territory to avoid a ruthless fiance and to set up her pottery business where she will make ring flasks and other items. She needs the rich clay deposits of Cherry Creek that exist on the land her late uncle has deeded to her. Unfortunately, the four Ashmore brothers also need Cherry Creek to water their cattle. And thus, the story begins. To make some money, Julia aligns herself with a Ute Indian to gather wild horses which she then sells to the army. Two Bears, a renegade Indian, is enthralled by her ring flasks and bright red hair, naming her "red fox woman." Ring flasks were made by redware potters in the 1800s on the East Coast and used by workers to carry their water to the fields. A ring flask such as the one on the book's cover will hold a little over twelve ounces. The fired red clay and the thick ring design help to keep the water cold. "Red Fox Woman" was a finalist in the Best Book Awards and the International Book Awards.